The Oregon Chorale was founded in 1985 by Bernd Kuehn, choir director in the Hillsboro, Oregon School District. Mr. Kuehn retired in 2015, and after a transition year, the Chorale chose Jason Sabino (BA USC, MA in Choral Conducting, Portland State University) to be its second artistic director. The Oregon Chorale is the only classical, auditioned choir in Washington County, Oregon. The Chorale has toured in Europe six times (1989, 1993, 1998, 2003, 2008, 2014) and has produced four CDs. The Chorale performs six concerts per year, every year since its inception, including seven original musicals under the direction of Linda Needham. In addition to its regular concert series, the Chorale has performed regularly in the Grotto’s “Festival of Lights”, and other choral events from Astoria to Hillsboro to Portland, Oregon. The Chorale is committed to fostering the musical development of young people in Washington County. The internship program started in 2000, and continues to offer twelve talented high school singers the opportunity to rehearse and perform with the Chorale each year. The Chorale also provides free admission to its concerts to all those under 18 years of age. 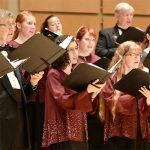 The Oregon Chorale prides itself on its ability to perform in many languages and styles, moving across musical genres, always aiming to communicate, engage, and entertain. The Oregon Chorale enriches and transforms people’s lives through inspiring music. The Oregon Chorale is an adult community choir that promotes choral singing through quality performances and mentorships for young singers. We love to sing together and share music with our community. We believe music can unite us in our diversity. We make unique musical experiences accessible to our audiences. We foster an environment where the next generation of singers can learn and be inspired to musical excellence.